Not sure how this depicts The Moon? Click here. Etteilla: Rain, Dew, Water, Humidity, Instability, Fickleness, Conversation. 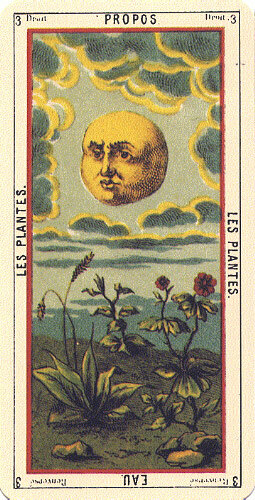 Illustration (left): Plants (corresponds to the Moon) from Tarot Egyptien: Grand Jeu de lOracle des Dames (c. 1870), re-published by Editions Dusserre. Click the image for a larger one. Lévi: This hieroglyph depicts the moon, dew, a crab rising in the water towards land, a dog and wolf barking at the moon and chained to the base of two towers, and a path lost in the horizon and sprinkled with blood. Christian: Whosoever dares to confront the unknown faces death. The hostile spirits, symbolised by one dog, wait in ambush; the servile spirit symbolised by the other, conceal their treacheries with base flattery; and the idle spirits, symbolised by the crab, will pass by without the slightest concern for disaster. Papus: This card depicts a meadow bounded by a tower on each side. Drops of blood are falling from the moon. The material world is the last point which the spirit can reach; it can descend no lower. This is shown by the boundaries of the field. The drops of blood represent the descent of the Spirit into Matter. Illustration (left): The Moon from Antichi Tarocchi Bolognesi by Giacomo Zoni (c. 1780), re-published by Lo Scarabeo. Click the image for a larger one. Felkin: From the waters edge, depicted on this card, winds the dark path of toil, effort, and possible failure. It is the path of blood and tears in which fear, weakness, and fluctuation must be overcome. Waite: The card represents life of the imagination apart from life of the spirit. The path between the towers is the issue into the unknown. The dog and wolf are the fears of the natural mind in the presence of that place of exit, when there is only reflected light to guide it. Wirth: By observing the effects of the moonlight how can we not think of the imagination whose way of illuminating is revealed in a similar way in our intellect? The imaginative visionary sees things in a false light. In metaphysics he forges erroneous theories, based on unreal contrasts and optical illusions of the mind. Case: The Moon symbolizes the reflected light of subconsciousness. The shell-fish climbing from the pool is a symbol of the early stages of conscious unfoldment. The path passes between two animals of the same genus, both canine. One, a wolf, remains what nature made him. The other, a dog, is a product of human adaptation. Thus the path passes between the extremes of nature and art. Crowley: The moon depicted here is the waning moon, the moon of witchcraft and abominable deeds. She is the poisoned darkness which is the condition of the rebirth of light. This is the threshold of life; this is the threshold of death. All is doubtful, all is mysterious, all is intoxicating. Sadhu: Of all the Arcana, The Moon is the most ominous and unfavourable. It describes the most dangerous conditions in which Man can place himself because of his own stupidity and lack of inner sight. Gray: Imagination, intuition, dreams. May mean bad luck to one you love. Unforseen perils, deception, secret foes. ONeill: To the Renaissance alchemist, the card might have suggested the process of Dissolution, the trial by bitter water. To the Christian mystic, this is the Dark Night of the Spirit, another period of depression and loneliness that affects a catharsis at a higher and more spiritual level. Pollack: The Moon also suggests the power and mystery of womens fertility. Menstruation is miraculous, because menstruating women bleed yet do not die. Further, many women find themselves more emotional, but also more psychic when menstruating. Fearing this power, men have created disturbing myths and taboos around menstruation. Turk: The Moon represents a state of flux and illusion. The twin rocks, or towers, depicted on each side of the central path rises up as a warning that approach to the domain of the Moon is beset by very real psychic dangersthe perils of the soul in primitive man. Symbol (top): It is one of the more elaborate in this collection; it comprises two areas. At top, two dogs or wolves howl at a full moon; at bottom, a lobster emerges from a body of water. These images often comprise, in part, this Arcanum.